As we enter the home stretch of the 2008 presidential campaign, it is strikingly evident that America has never been more divided. We are a people alienated from ourselves and our government. When the red staters and the blue staters do manage to speak to each other, rancor, mistrust and intolerance drown out all but the most earnest attempt at civil dialogue. Into this environment comes an extraordinarily timely new book that attempts to bridge the gap, re-establish connections and help all Americans find deeper meaning in our lives. 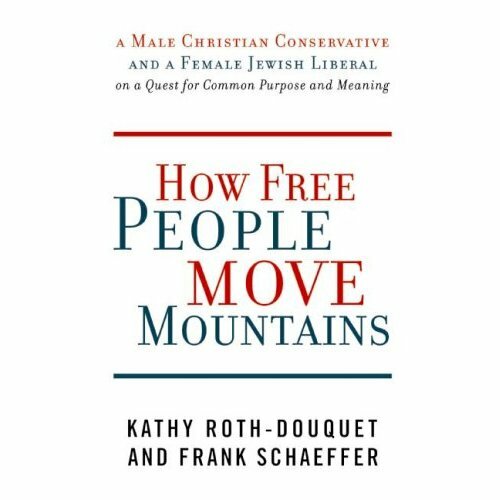 How Free People Move Mountains: A Male Christian Conservative and a Female Jewish Liberal on a Quest for Common Purpose and Meaning (September, 2008; $24.95), by Kathy Roth-Douquet and Frank Schaeffer, is a hopeful and bold narrative that movingly illustrates how Americans might begin to talk to each other again and rediscover the shared values that define us as a people. A highly readable, sometimes funny, sometimes contentious, back and forth dialogue, the book brings together a founder of the modern evangelical movement and a liberal Jewish former Clinton aide. These two thoughtful and highly articulate friends – each in their own way, deeply spiritual, passionate and patriotic – explore the American dream and American values and turn them inside out to re-invent and redefine their true meaning. Imbued with the bold premise that, at this critical point in our history, transcending our narrow selves is not an option, How Free People Move Mountains challenges us to move beyond the superficial consumerism that is eating away at our ability to function as a society. It is a call to action that 300 million Americans cannot ignore and must take to heart – not just for ourselves but for our children and future generations. Published by Collins Books, of Harper Collins, May 2006. 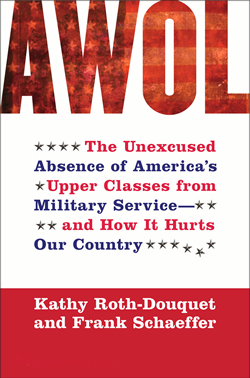 AWOL exposes a critical but hidden issue : the absence of the leadership classes from the military and how that absence creates a failure of democracy. When those who make, support and protest defense policy to the greatest effect have the least actual experience with military – either through their own service, or the service of those close to them – America does not get the best policy possible. Moreover, the class gap harms our nation's solidarity and ability to sustain engagements. AWOL's authors speak from both sides of the divide. Kathy Roth-Douquet is a former Clinton White House and Pentagon appointee, now married a Marine Corps officer who has deployed twice to Iraq; she lives on a military base in North Carolina. Frank Schaeffer is a writer living in Boston whose his son enlisted in the Marine Corps out of prep school, deployed to Afghanistan and Iraq, and is now back in college. AWOL urges a broader sense of ownership and participation in the military among those in the privileged classes. Moreover, authors Kathy Roth-Douquet and Frank Schaeffer argue that military service is not bitter medicine, that those who experience it – including the most privileged – often find it to be inspiring and sustaining, and it can reaffirm their connection to their country. AWOL makes a policy argument, using surveys and current research, but it is also tells the personal story of the journey of two American families.